Here's how I do my Thanksgiving turkey. I buy a fresh organic free range turkey. They are more expensive. They are also, in my opinion, more than worth the price. I order it at the butcher counter in my regular grocery store and ask that it be ready for pick up the day before Thanksgiving. One nice thing about this is that I don't have a humongous thawing bird sitting in my fridge for days. Just has to sit there overnight. you may use salt to season but don't tell me about it, it's not good for my blood pressure. Early in the morning, I take the bird out of the fridge remove the neck and bag(s) of goodies (check both ends so you don't bake a surprise inside), rub it with salt inside and out and rinse - not because I know this to be a good thing to do for some strange and wonderful purpose; but because this is how I've done it and I've never until this very moment questioned the salt rubbing....EDITED*** There will no longer be any salting and rinsing of my turkey per the reasons at the end of the post. So, just rub it over with several paper towels quickly disposed of and not left lying about willy nilly and place the now dried off bird in the pan that for roasting, breast side up. Carefully insert your fingers between the skin and the breast meat and separate without tearing it off. Place cut fat chunks of applewood smoked bacon under the skin - do not trim the fat - and cram as much bacon in the space as possible. It will look lumpy and that's ok. 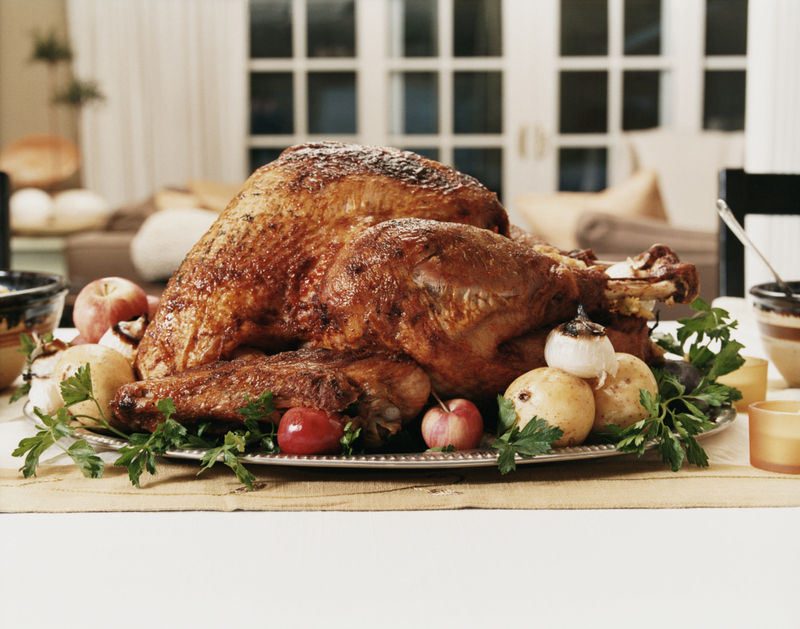 It's not a beauty contest; the goal is a great tasting turkey. This minimizes the necessary basting which means you don't have to open the oven as much and the bird will cook faster. I still baste though, just not as often as I used to. The bird will sit patiently while I prepare the stuffing allowing it to come closer to room temperature which shortens the cooking time a tad and also allows for the turkey and stuffing to finish together. Stuff the thing LIGHTLY with the just made warm stuffing. Don't make the stuffing too moist, remember the bird will baste the stuffing and add moisture. Lightly also makes sure the stuffing reaches the right temp at the same time as the bird. Rub some softened butter over the skin. Not margarine. Butter. Not "light" butter. Real butter. Skip it if you can't bring yourself to use butter, but if you do I will insist that you make a special melted butter baste to use instead of the stock. Sprinkle with fresh cracked pepper, thyme, maybe some dried parsley or any other seasoning you enjoy with turkey. Use an oven safe meat thermometer in the bird. Here's a good pic and description of just where to put it. Then pour two cups of good quality chicken stock in the pan, loosely tent with foil, and pop in the oven (lowest rack) - how long depends on the size of the bird (just read the package directions) and what if anything you put inside the cavity. Insert an oven safe meat thermometer at the inner thigh area near the breast of the bird, but not touching bone.Tent very loosely with foil. You will probably be screaming at me right now: You forgot to truss the turkey!!!!! Well, I don't truss. There are trussers and non-trussers and I am of the latter persuasion and have not seen much reason to do so except that it keeps the tidier of chefs happy. While all this prep is happening, preheat the oven to 325 F. Our typical 16-20 pound bird roasts for about 5 1/2 - 6 hours or until the internal temperature all over the bird and within the stuffing is 165 F; usually the leg and wing will be a bit wiggly then too. Birds are interesting things and each will take a different amount of time to cook. Some have bigger breasts, some were working out on the leg machines and have massive thighs and all that messes with the cooking time. So check the package directions as the farmer knows the bird better than you do. Remove the foil after about 2 hours or so of cooking so the bird will have time to brown all pretty. Baste with the pan drippings when you remove the foil and then baste later when you are checking the temperature in hopes that it might be nearing readiness. Try not to check too much as each time you do the heat is let out of the oven and slows the whole process down. I used to be a major checker and baster and the birds took a good hour or more longer than necessary to cook because of that. Once the bird checks out to a nice 165 F on the in-oven thermometer, check a couple other places with an instant read thermometer...don't forget to check the stuffing temp. Have someone strong take it out of the oven and tip the turkey carefully so that some of the juices run out onto the roasting pan to be used for gravy. Plate it to a platter or baking pan with a raised edge to catch any other errant juices. Then tent it with aluminum foil for at least 20-30 minutes (more is fine if you can stand the wait). Waiting is good. This is when you can do a lot of other fun things to make the meal awesome. Sitting around inside a tent allows the juices to spread throughout the meat so they don't all squirt out when you slice and the meat will be even more delicious. The temperature will continue to rise under the foil to about 180 F which is good and why you tent. Remove the stuffing to a bowl and double check the temp (nuke if necessary, but you should be just fine unless you crammed too much stuffing in there). Put the bird on the serving platter either pre-sliced or ready to slice at the table. If someone is in the kitchen slicing ahead of dinner, keep an eye on him as he has a tendency to eat quite a bit as he slices "just to make sure it's good". Follow up on rinsing the turkey: well, that didn't take long. Opinions are as strong and diverse on this topic as on any other cookery topic. Chefs are very intense people. I do not believe I will ever rinse my turkey again. I will do it like I do the chicken and just rub off the stuff with paper towels properly disposed of right away. Why? Safety. If you rinse the bird, bacteria from raw poultry can splash onto worktops, dishes, the sink, and other foods. Proper cooking will kill any bacteria and unless the bird looks like it just came in from a game of flag football in the mud, I will no longer rinse. I still stand by my opinion that rinsing changes the flavor of meat anyway. Keep your hands and any surface the turkey touches clean with lots of washing up too, ok? are we using salted or unsalted butter on the outside on the skin and in the basting sauce? you use whichever you prefer. I generally use salted because I never add salt to things otherwise and salt in the butter is fine. If you need to be even lower in sodium than I do, then use unsalted. I've never tried it but maybe I will this year. Lots of real chefs seem to like it best. Sounds great, and I never thought of the rinsing as any issue at all, but did it as I thought should, but am glad to see I can safely skip it, and great idea about putting bacon under the skin, I usually put herbs or sage under it, fruits (oranges, lemons, ect) have been used also, but the bacon lover in me is rather excited of the possibilities of this idea. Only down side is that I will not be cooking thanksgiving dinner this year as I will be traveling to another state to join my mom and brother for thanksgiving for the first time in 34 years. But I am sure I will still be cooking one before christmas. Thanks!